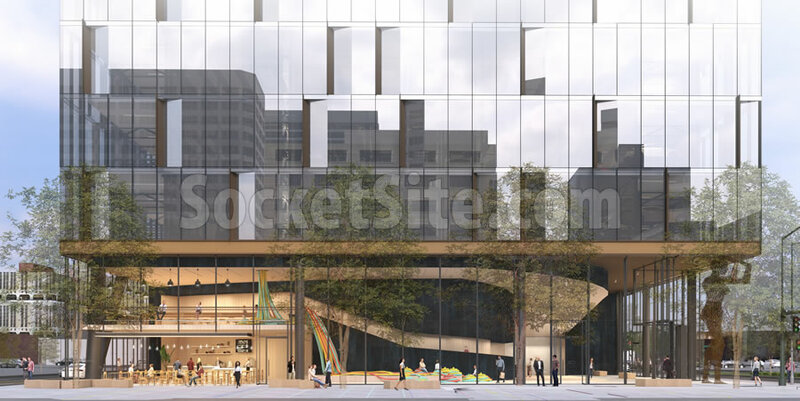 As designed by Solomon Cordwell Buenz (SCB) for TMG Partners, the 2201 Valley tower would yield 757,000 square feet of “creative” office space (with high ceilings, open floors and a couple of large outdoor terraces and a landscaped green roof) over a 350-space podium garage; 7,500 square feet of retail/gallery space along Telegraph Avenue and a 30-foot-tall lobby at the corner of Valley Street. 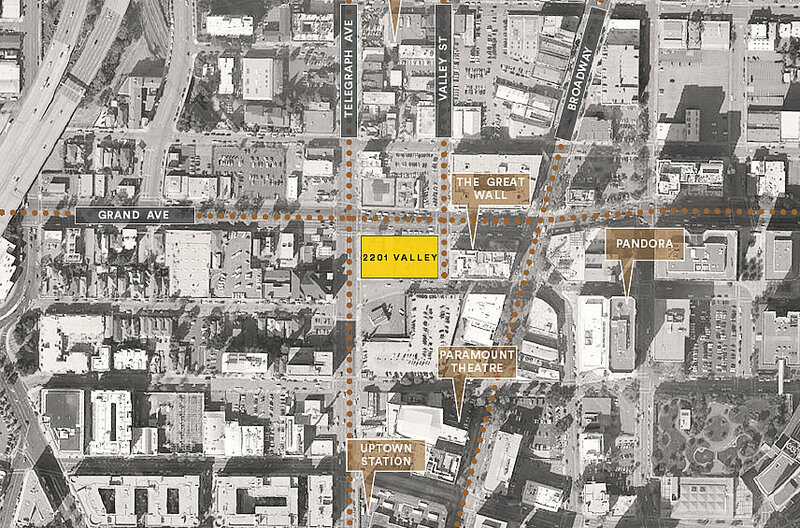 And as envisioned, Valley, between Grand and 22nd, would be converted into a limited access “slow street” and pedestrian promenade with a spillover café and effective infill plaza at the corner of 22nd. We’ll keep you posted and plugged-in. Now THAT’S an interesting, compelling design and concept. 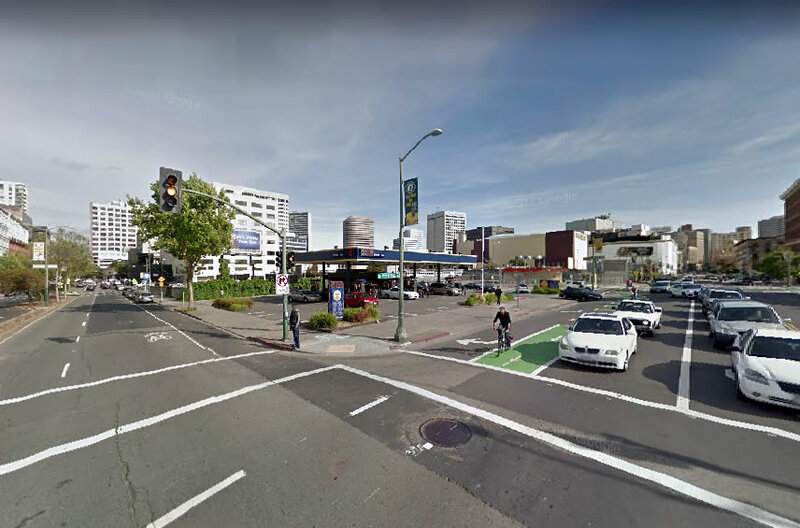 Oakland’s [Planning] can redeem their disgraceful rejection –– on the entirely bogus “preservation” of a “historical” structure that is in fact a rundown, trashed, derivative commercial space –– of the compelling twin-tower high rise proposed for Harrison Street. This is the moment in which even atheists will pray that Oakland’s great hinderer, its planning and design departments, actually let this project come to full fruition. Man, this is a beautiful building and it’s a whole 5ft talker than the building on the King block Oakland just lost to the preservationists. This would become the tallest building in Oakland. Getting closer to 500ft, but not quite there yet for Oakland. 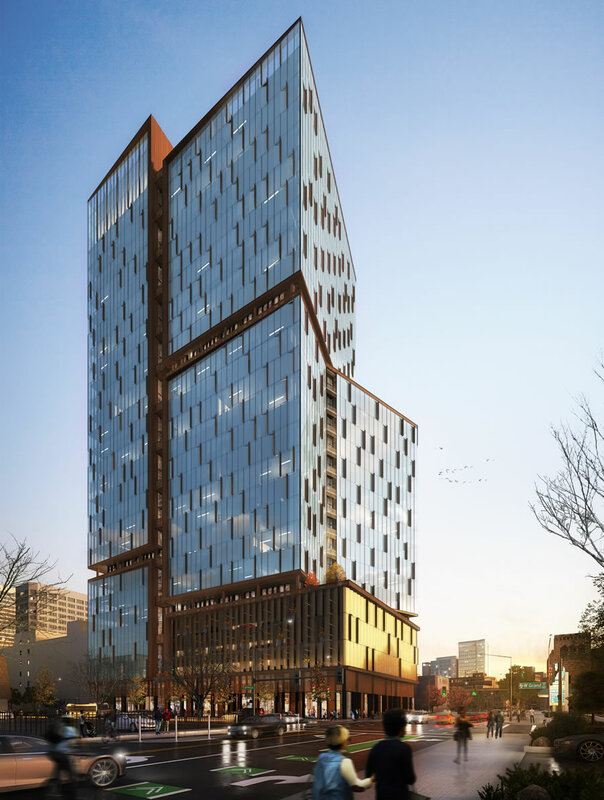 The proposed Valley Street tower is technically 420 feet tall with a partial 45-foot mechanical enclosure atop the building (which Planning would like to see stepped back from the tower’s western facade). I see, thanks for the info. Still, at 420 feet, it would be 16ft taller than the Ordway Building which is currently the tallest in Oakland. I still haven’t heard of a proposal for anything 500ft or over for Oakland. Why do they want it stepped back? It looks perfect the way it is. I do like this design. What are the odds it will be built? My dream is to see a 700 footer in DTO Oakland. It seems – to me at least – to look remarkably like this, which I suppose isn’t terribly surprising given that it’s the same developer; and take note everyone: proposing the same thing twice – in different cities, no less – increase the chance it will be built. Also apparently unrelated to the mega-project proposed next door and yet both right over the BART tracks…developers seem to be seeking out DTO’s most challenging locales! Challenging and rewarding sites. Nothing like being right next to a BART station. Although nothing beats the “Uber” building on Broadway for BART access. This looks like a fantastic project. I love the idea of the pedestrian promenade tied to this interesting building. 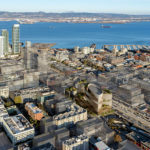 They are building the tallest buildings in SFO on fill, sand and clay and soil vulnerable to liquefaction during an earthquake and need to spend a crazy amount of money on foundation work just because of the desirable location. 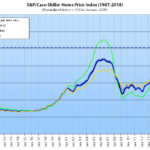 I don’t think a BART tunnel will hold developers back. Check out Hudson Yards in New York City. “plan to build an entire 26-acre neighborhood with 17 million square feet of buildings atop two platforms suspended over an active rail yard serving America’s busiest train station”. Engineers can build tall buildings on top of all sorts of things. Yes, you are correct. I have seen the massive buildings on top of the Hudson Yards train tunnels. BART tunnels in DTO should not be a huge deal. Very cool! Fingers crossed. Hopefully it gets built. this gas station is shady AF but always has the cheapest gas. would be amazing if this got built. Mash? Shady? No, try stylish. It was just remodeled. They keep it really clean and drown out the bass thumpers with middle eastern. It’s an exciting time to see all these towers being proposed in the heart of Oakland — previous thread notwithstanding. With that said, from an urban design standpoint I’ll be even more over the moon when said towers pencil out to the point that these darned parking podiums become a thing of the past. They should do away with the parking for residential towers within three blocks of DTO BART stations. No parking in Manhattan and they do just fine. Could not agree more! 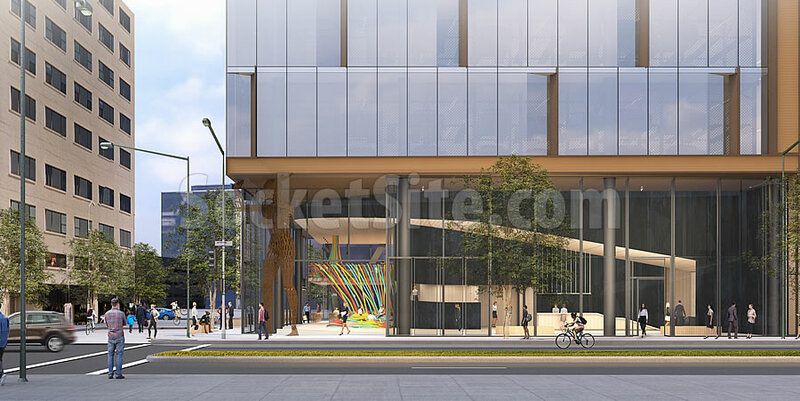 1640 Broadway (also designed by SCB and currently under construction) is a particularly egregious example of planning’s parking podium pandering (say that 10 times.) 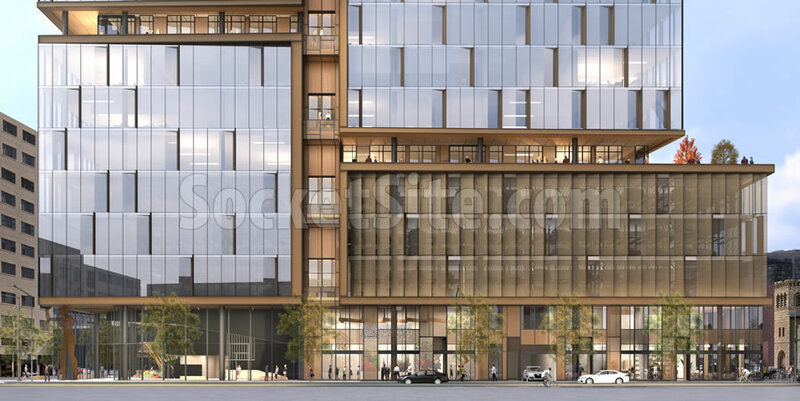 As you know, that development sits directly atop the 19th St. BART station and its primary facade street will have four stories of parking fronting Oakland’s main street. You are correct. I walked right by 1640 Broadway on Saturday. The BART station entrant is virtually at the front door of this 33 story residential highrise. Makes no sense. I’m sure said towers would pencil out without a parking podium. Does anyone worry that the units would go unsold if parking wasn’t part of the sale? We already know how rapidly zero-parking units get snapped up in SF – Donald Shoup and Marty Wachs both documented that years ago — and DO is more “SF” than much of SF is.